Besides the charity which goes out to meet the bodily necessities, there is that which seeks to repair the life of the soul. It is relatively easy to be moved by the necessities o the body. Even without faith, simply through philanthropic motives, well-doing can be pursued. But if we are moved by the lot of those who live in sin, of those who are in danger of losing their souls forever, that is the most sublime charity, the fruit of the gift of Understanding that penetrates into the mystery of sin. 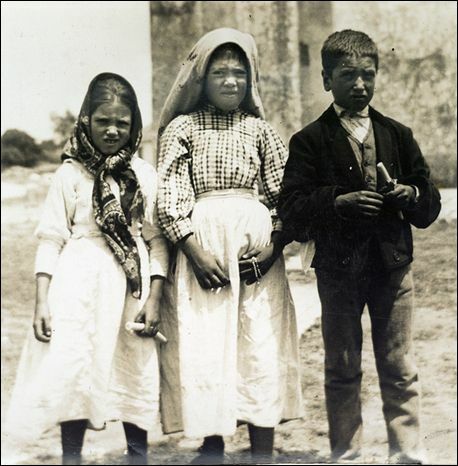 The light of God shone into the souls of these little children of Fatima, the gift of Understanding made them understand the danger of sin, and led them to embrace a heroic life of mortification, to deliver the sinners from falling into Hell. In today's gospel, Jesus warns the apostles against their pursuit of celebrity. They were arguing about who was the greatest. What does Jesus say and do? He doesn't chide them, but gives them a lesson in humility. He puts his arm around a child and tells them to become like little children. Jacinta, Francisco, and Lucia didn't worry about who was the greatest, they simply gave a resounding "Yes!" to the requests of the beautiful lady from heaven. And what a response it was. The more I read about the children and their heroic sacrifices, the more I want to imitate them. "Make me like that little seven-year-old Jacinta, Lord, who had such love and zeal for "poor sinners." Lord, make us all like little children -- totally trusting in You, humble, with hearts on fire for the salvation of souls. Help us to imitate the little ones of Fatima who were so quick to embrace your will -- through the intercession of our Mother Mary, Amen.